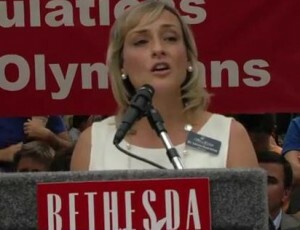 Stone Ridge School of the Sacred Heart Head Catherine Ronan Karrels introduces Olympic Swimmer Katie Ledecky, a 15-year-old sophomore at Stone Ridge, to a crowd of supporters at a recent Bethesda celebration. Take a look. 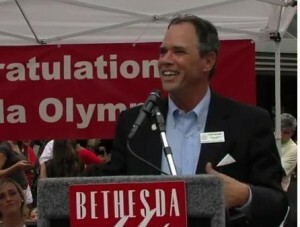 Montgomery County Council President Roger Berliner delivers County Council proclamations to the three U.S. Olympic athletes from Bethesda. Take a look. 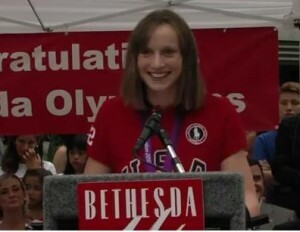 Olympic Gold Medalist Katie Ledecky (15) won the 800 meter freestyle and shattered a 23-year-old American record. Take a look at this video as she tries on her medal for friends and fans who greeted her at Dulles International Airport after weeks away. 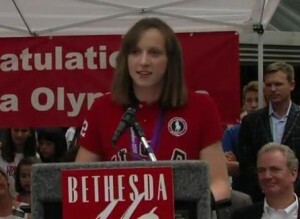 With her mom and dad walking behind her, Olympic Gold Medalist Katie Ledecky (15) of Bethesda rushes into the open arms of her Stone Ridge classmates at Dulles International Airport on Aug. 6. Take a look at this heartwarming homecoming and find out what the sensational swimmer is looking forward to next.